As reported late last month, Peyton Reed is currently in final negotiations to step back up to the plate for the Marvel Studios sequel Ant-Man and the Wasp after successfully directing the first Ant-Man film, which has grossed more than $517 million at the worldwide box office. 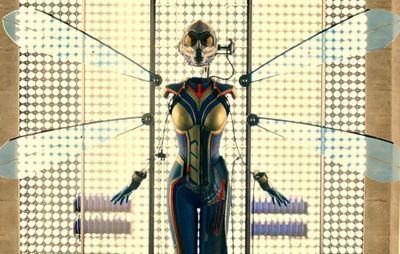 While promoting the December 8 release of Ant-Man on Blu-ray/DVD, Reed spoke to MTV about the second installment and the importance of showcasing Evangeline Lilly’s Hope van Dyne, aka The Wasp. Order your copy of Ant-Man on 2-Disc 3D Blu-ray combo pack right here! Although their relationship was a little antagonistic at the beginning, Hope and Paul Rudd’s Scott Lang were definitely breaking the ice by the end of the first movie. A lot of that tension came from her dad Hank Pym (Michael Douglas) deliberately holding her back, despite being clearly capable, though now Hope has an opportunity to (literally) spread her wings. In fact, the surprise addition of Ant-Man and the Wasp to Marvel’s ever-expanding Phase 3 slate will make Lilly the first female character to play a title role in a Marvel Cinematic Universe movie. As for Pym’s wife Janet van Dyne (briefly glimpsed in-constume in an Ant-Man 1 flashback), still lost among the surreal world of the Quantum Realm, it sounds like the hunt to bring her back to the land of the living will happen in the next movie, with Reed hinting that he has definite casting ideas for who to take on that role opposite Douglas. He has also apparently been privy to all of Rudd’s footage as Ant-Man in next summer’s all-star blockbuster Captain America: Civil War. Ant-Man and the Wasp will feature the return of Paul Rudd as Scott Lang alongside Evangeline Lilly as Hope Van Dyne. Although no writers have been announced yet, Adam McKay recently told THR that he’s had discussions with Paul Rudd about returning to co-pen the sequel after they successfully retooled Edgar Wright’s script on the first movie. Kevin Feige once again produces the Marvel Studios film for a targeted release date of July 6, 2018.